Licensed to seat up to 10 passengers, the Harvey A offers a private, luxury cruising experience designed to create a feeling of ownership of your vessel for the duration of your cruise. 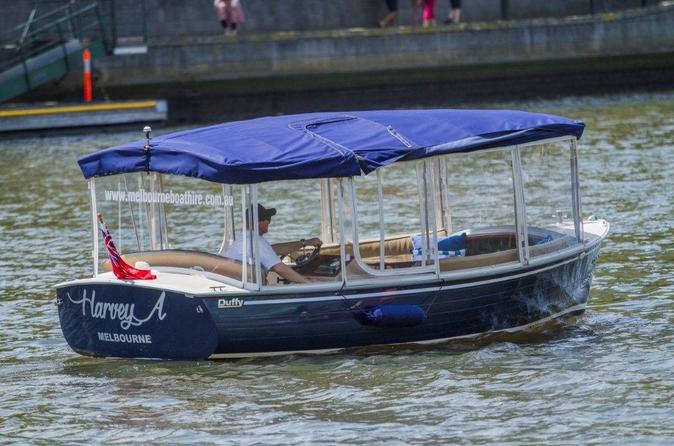 Harvey A is a fully electric powered vessel meaning a quieter cruise for you and your guests with no fumes or emissions with the option of a fully enclosed cabin should Melbourne turn on inclement weather. With no license required and a self-drive hire option available, the Harvey A can be yours for a morning, lunch or afternoon cruise. Take in Melbourne's feature landmarks from a completely new perspective away from the hustle and bustle of the busy streets such as the Botanical Gardens, Herring Island Park, the Melbourne Cricket Ground, Southbank, Federation Square and Docklands as well as the Yarra surrounds of jetties, parks and its breathtaking riverside beauty. Take a luxury self-drive boat perfect for an intimate cruise with your loved one or alternatively a small corporate function or social gathering. The Harvey A offers everything you need to enjoy a day or evening on the water.